Though I’m still working on some more significant writing, I wanted to keep up with my blogging by sharing a few pictures of my classroom. Since I’ll probably be writing a good deal about teaching once school is underway, I figured it might be helpful to have a visual of the setting for all future school-related posts. 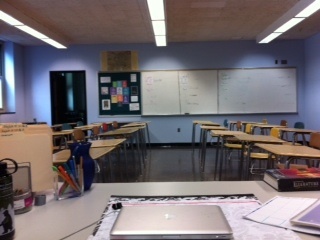 I spent last Monday at school arranging furniture, creating bulletin boards, and setting up file folders. The halls were empty, and aside from the janitor, I was alone in my wing of the building. 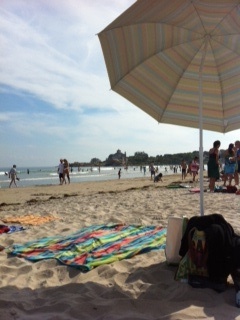 Such times of quiet are very rare during the school year, and I was grateful for the peaceful time to work. I’ve been badly procrastinating curriculum planning until this last week of summer, but spending time at school on Monday made me feel like I was being proactive about at least one aspect of returning to school. This is the view from my desk in the front of the room. I think I walk up and down the middle aisle 87 times each day. No joke. I’ve struggled with whether this is the best arrangement of desks, since the kids tend to make ridiculous faces at each other from across the room. I swear they think I can’t see them, which is ironic given they are adolescents and typically believe everyone is looking at them all the time. However, this layout seems more encouraging of interaction and discussion than traditional rows, so it’s where I’ll start. 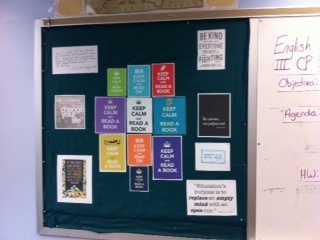 It might seem silly for a teacher of 11th and 12th graders, who I generously refer to as “practically adults” on certain occasions, to make bulletin boards, but I do. To leave the walls of my classroom as they are would make for a horribly drab environment, so I try to add some color, as much for myself as for my students. The most frustrating question I get asked by absent students on a daily basis is “Did I miss anything?” Seriously, this question drives me insane. What do they expect me to say?? “No, Student, in your absence, we sat around mournfully staring at each other, unsure how to move forward, hoping for your return. Thank you for coming back. Now we can all begin learning again!” To avoid losing my mind from having to answer this question 7 times a day (multiplied by 180 days), I set up a series of file baskets that contain the work covered in each class on each day. 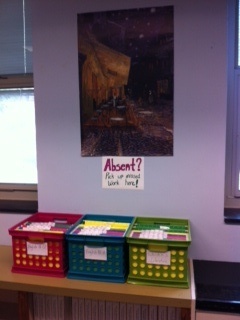 The idea is that students check the basket for missed work before asking me what they missed. Bonus: it helps to keep me organized as well. I used to have my desks set up like that last year, and my kids complained that they had to turn their heads to look at the board. It really did make for better discussions though, so I may try it again mid-year. Congrats on FP and on beginning your 2nd year of teaching! 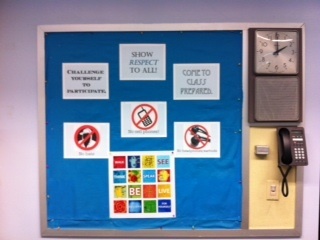 I think it’s great to have bulletin boards — even for older students– and you can engage them in helping you create them. I’ve taught and write- so hope you check out my blog. Feel free to ask about teaching! I used to set up my desks the same way and change it as my units changed. I always like to break up the monotony for students. It really helps keep them on their toes whenever they enter my classroom. I used to have a sign on my wall that said, “Teaching and Learning Doesn’t Stop Because You’re Not Here.” The crates are a great management strategy that works well.